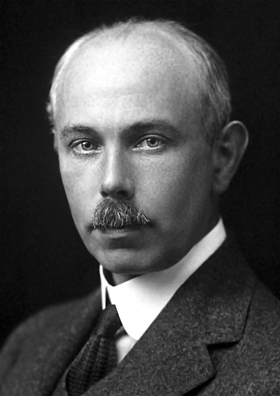 Ernest Rutherford and Frederick Soddy publish their theory of radioactive decay. In December 1903, the Royal Swedish Academy of Sciences awarded Pierre Curie, Marie Curie, and Henri Becquerel the Nobel Prize in Physics, "in recognition of the extraordinary services they have rendered by their joint researches on the radiation phenomena discovered by Professor Henri Becquerel." 2. electrons revolving around the nucleus, bound by electrostatic forces (in analogy to the rings revolving around Saturn, bound by gravitational forces). 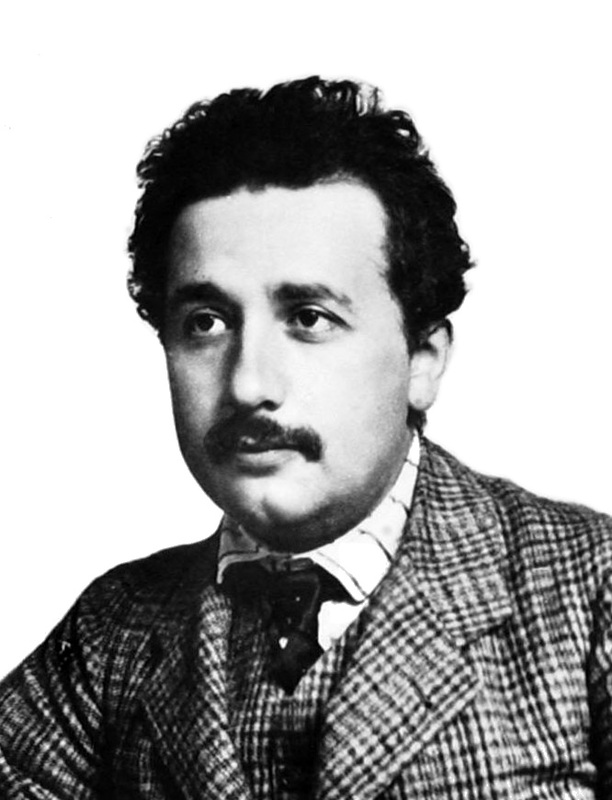 Albert Einstein publishes "On the Electrodynamics of Moving Bodies"
Albert Einstein's "Zur Elektrodynamik bewegter Körper" ("On the Electrodynamics of Moving Bodies"), his third paper that year, was received on June 30 and published September 26. It reconciles Maxwell's equations for electricity and magnetism with the laws of mechanics by introducing major changes to mechanics close to the speed of light. This later became known as Einstein's special theory of relativity. Millikan worked on an oil-drop experiment in which he measured the charge on a single electron. 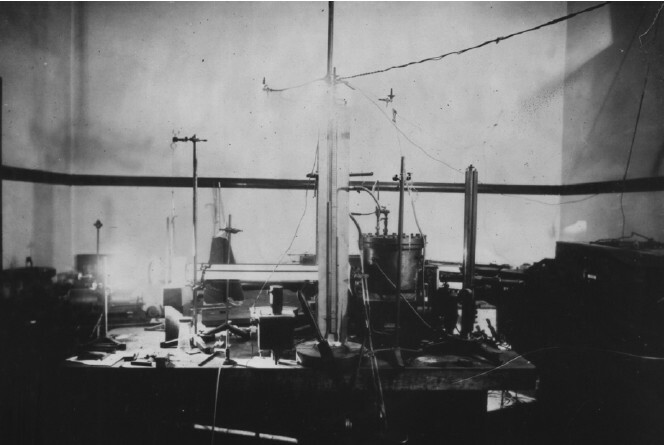 Millikan's setup for the oil drop experiment. The Rutherford model is a model of the atom devised by Ernest Rutherford. Rutherford directed the famous Geiger-Marsden experiment in 1909 which suggested, upon Rutherford's 1911 analysis, that the so-called "plum pudding model" of J. J. Thomson of the atom was incorrect. Rutherford's new model for the atom, based on the experimental results, contained the new features of a relatively high central charge concentrated into a very small volume in comparison to the rest of the atom and with this central volume also containing the bulk of the atomic mass of the atom. This region would be named the "nucleus" of the atom in later years. Anything From Wikipedia, the free encyclopedia. Video from You Tube. Basic diagram of the atomic planetary model: electrons in green and nucleus in red. In atomic physics, the Bohr model, introduced by Niels Bohr in 1913, depicts the atom as a small, positively charged nucleus surrounded by electrons that travel in circular orbits around the nucleus—similar in structure to the solar system, but with attraction provided by electrostatic forces rather than gravity. Moseley's law is an empirical law concerning the characteristic x-rays that are emitted by atoms. The law was discovered and published by the English physicist Henry Moseley in 1913. It is historically important in quantitatively justifying the conception of the nuclear model of the atom, with all, or nearly all, positive charges of the atom located in the nucleus, and associated on an integer basis with atomic number. Aston initially worked on the identification of isotopes of the element neon and later chlorine and mercury. After the war he returned to research at the Cavendish Laboratory in Cambridge, and completed building his first mass spectrograph that he reported on in 1919. De Broglie's essential idea was to extend to all particles the coexistence of waves and particles discovered by Einstein in 1905 in the case of light and photons. This theory set the basis of wave mechanics. It was supported by Einstein, confirmed by the electron diffraction experiments of Davisson and Germer, and generalized by the work of Schrödinger. In January 1926, Schrödinger published in Annalen der Physik the paper "Quantization as an Eigenvalue Problem" on wave mechanics and presented what is now known as the Schrödinger equation. In this paper, he gave a "derivation" of the wave equation for time-independent systems and showed that it gave the correct energy eigenvalues for a hydrogen-like atom. This paper has been universally celebrated as one of the most important achievements of the twentieth century and created a revolution in quantum mechanics and indeed of all physics and chemistry. While reading over a journal article by Rolf Widerøe, Lawrence was intrigued by a diagram of an accelerator that produced high-energy particles. He contemplated how it could be made compact, and came up with an idea for a circular accelerating chamber between the poles of an electromagnet. The result was the first cyclotron. Anything From Wikipedia, the free encyclopedia. John Cockcroft and Ernest Walton "splitting the atom"
In 1928, John Cockcroft began to work on the acceleration of protons with Ernest Walton. In 1932, they bombarded lithium with high energy neutrons, electrons and protons and succeeded in transmuting it into helium and other chemical elements. This was one of the earliest experiments to change the atomic nucleus of one element to a different nucleus by artificial means. This feat was popularly – if somewhat inaccurately – known as splitting the atom. 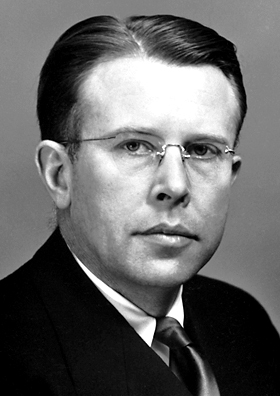 In 1951, Cockcroft, along with Walton, was awarded the Nobel Prize in Physics for his work in the use of accelerated particles to study the atomic nucleus. Anderson began investigations into cosmic rays during the course of which he encountered unexpected particle tracks in his cloud chamber photographs that he correctly interpreted as having been created by a particle with the same mass as the electron, but with opposite electrical charge. This discovery, announced in 1932 and later confirmed by others, validated Paul Dirac's theoretical prediction of the existence of the positron. For this work, Anderson shared the 1936 Nobel Prize in Physics with Victor Hess. The concept of a nuclear chain reaction was first hypothesized by Hungarian scientist Leó Szilárd on Tuesday, September 12, 1933. The neutron had been discovered in 1932, shortly before. Szilard realized that if a nuclear reaction produced neutrons, which then caused further nuclear reactions, the process might be self-perpetuating. Through experiments inducing radioactivity with recently discovered neutrons, Fermi discovered that slow neutrons were more easily captured than fast ones, and developed the Fermi age equation to describe this. After bombarding thorium and uranium with slow neutrons, he concluded that he had created new elements; although he was awarded the Nobel Prize for this discovery, the new elements were subsequently revealed to be fission products. In 1934 they made the discovery that sealed their place in scientific history. Building on the work of Marie and Pierre, who had isolated naturally occurring radioactive elements, Joliot-Curies realized the alchemist’s dream of turning one element into another, creating radioactive nitrogen from boron and then radioactive isotopes of phosphorus from aluminum and silicon from magnesium. The German nuclear energy project (German: Uranprojekt; informally known as the Uranverein'; English: Uranium Society or Uranium Club), was an attempted clandestine scientific effort led by Germany to develop and produce atomic weapons during World War II. This program started in April 1939, just months after the discovery of nuclear fission in January 1939, but ended only months later due to the German invasion of Poland because many notable physicists were drafted into the Wehrmacht. A second effort began under the administrative auspices of the Wehrmacht's Heereswaffenamt on the day World War II began (1 September 1939). The program eventually expanded into three main efforts: the Uranmaschine (nuclear reactor), uranium and heavy water production, and uranium isotope separation. The Einstein–Szilárd letter was a letter written by Leó Szilárd and signed by Albert Einstein that was sent to the U.S. President Franklin D. Roosevelt on August 2, 1939. The letter warned of the danger that Germany might develop atomic bombs and suggested that the United States should initiate its own nuclear program. It prompted action by Roosevelt, which eventually resulted in the Manhattan Project developing the first atomic bombs. Otto R. Frisch and the physicist Rudolf Peierls produced the Frisch–Peierls memorandum, which was the first document to set out a process by which an atomic explosion could be generated. Their process would use separated Uranium-235, which would require a fairly small critical mass and could be made to achieve criticality using conventional explosives to create an immensely powerful detonation. The memorandum went on to predict the effects of such an explosion — from the initial blast to the resulting fallout. In February 1941, Seaborg and his collaborators produced, plutonium-239 through the bombardment of uranium. In their experiments bombarding uranium with deuterons, they observed the creation of neptunium, element 93. But it then underwent beta-decay, forming a new element, plutonium, with 94 protons. Plutonium is fairly stable, but undergoes alpha-decay, which explained the presence of alpha particles coming from neptunium. Thus, on March 28, 1941, Seaborg, physicist Emilio Segrè and Berkeley chemist Joseph W. Kennedy were able to show that plutonium (then known only as element 94) was fissile, an important distinction that was crucial to the decisions made in directing Manhattan Project research. The Office of Scientific Research and Development (OSRD) was an agency of the United States federal government created to coordinate scientific research for military purposes during World War II. Arrangements were made for its creation during May 1941, and it was created formally by Executive Order 8807 on June 28, 1941. 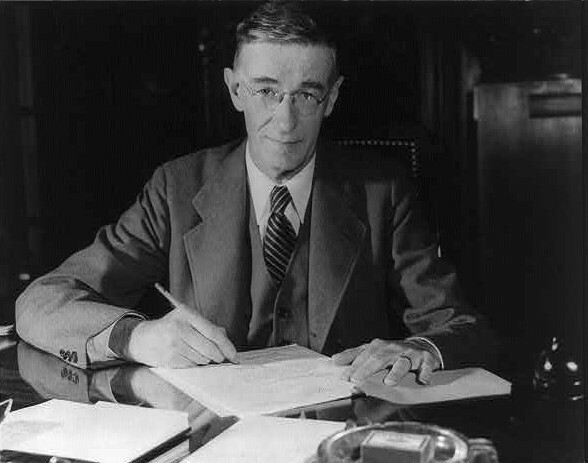 It superseded the work of the National Defense Research Committee (NDRC), was given almost unlimited access to funding and resources, and was directed by Vannevar Bush, who reported only to President Franklin Delano Roosevelt. The research was widely varied, and included projects devoted to new and more accurate bombs, reliable detonators, work on the proximity fuze, guided missiles, radar and early-warning systems, lighter and more accurate hand weapons, more effective medical treatments, more versatile vehicles, and, most secret of all, the "S-1 Section", which later became the Manhattan Project and developed the first atomic weapons. The Manhattan Project was a research and development project that produced the first atomic bombs during World War II. It was led by the United States with the support of the United Kingdom and Canada. From 1942 to 1946, the project was under the direction of Major General Leslie Groves of the U.S. Army Corps of Engineers. The Army component of the project was designated the Manhattan District; "Manhattan" gradually superseded the official codename, Development of Substitute Materials, for the entire project. Along the way, the project absorbed its earlier British counterpart, Tube Alloys. The Manhattan Project began modestly in 1939, but grew to employ more than 130,000 people and cost nearly US$2 billion (about $26 billion in 2014 dollars). Over 90% of the cost was for building factories and producing the fissile materials, with less than 10% for development and production of the weapons. Research and production took place at more than 30 sites across the United States, the United Kingdom and Canada. The Manhattan Project created the first nuclear bombs. The Trinity test is shown. In June 1942, the US Army established the Manhattan Engineer District to handle its part in the atom bomb project, beginning the process of transferring responsibility from the Office of Scientific Research and Development to the military. In September, Groves was appointed director of what became known as the Manhattan Project. Groves selected Oppenheimer to head the project's secret weapons laboratory, a choice which surprised many, as Oppenheimer was not known to be politically aligned with the conservative military, nor to be an efficient leader of large projects. The fact that he did not have a Nobel Prize, and might not have the prestige to direct fellow scientists, did concern Groves. 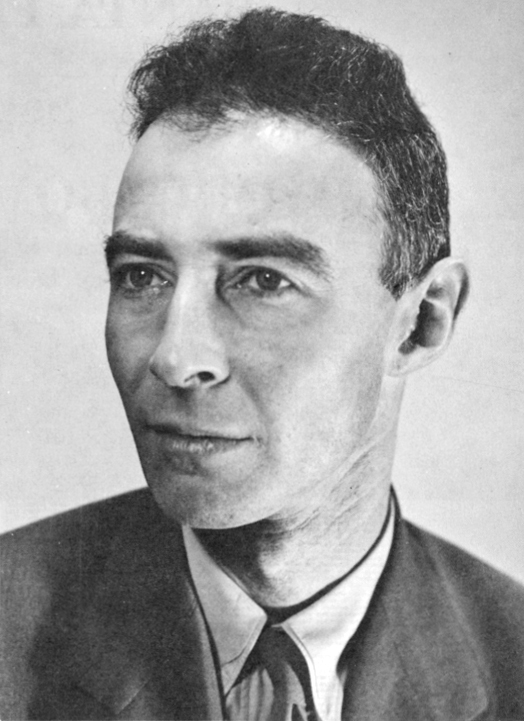 However, he was impressed by Oppenheimer's singular grasp of the practical aspects of designing and constructing an atomic bomb, and by the breadth of his knowledge. As a military engineer, Groves knew that this would be vital in an interdisciplinary project that would involve not just physics, but chemistry, metallurgy, ordnance and engineering. Groves also detected in Oppenheimer something that many others did not, an "overweening ambition" that Groves reckoned would supply the drive necessary to push the project to a successful conclusion. Leslie Richard Groves, Jr. was involved in most aspects of the atomic bomb's development. He participated in the selection of sites for research and production at Oak Ridge, Tennessee; Los Alamos, New Mexico; and Hanford, Washington. He directed the enormous construction effort, made critical decisions on the various methods of isotope separation, acquired raw materials, directed the collection of military intelligence on the German nuclear energy project and helped select the cities in Japan that were chosen as targets. Groves wrapped the Manhattan Project in security but failed to prevent the Union of Soviet Socialist Republics from conducting a successful espionage program that stole some of its most important secrets. After the war, Groves remained in charge of the Manhattan Project until responsibility for nuclear weapons production was handed over to the United States Atomic Energy Commission in 1947. Chicago Pile-1 (CP-1) was the world's first artificial nuclear reactor. The construction of CP-1 was part of the Manhattan Project, and was carried out by the Metallurgical Laboratory at the University of Chicago. It was built under the west viewing stands of the original Stagg FieldStagg Field. The first man-made self-sustaining nuclear chain reaction was initiated in CP-1 on 2 December 1942, under the supervision of Enrico Fermi. Fermi described the apparatus as "a crude pile of black bricks and wooden timbers." Made of a large amount of graphite and uranium, with "control rods" of cadmium, indium, and silver, unlike most subsequent reactors, it had no radiation shield and no cooling system. The Soviet project to develop an atomic bomb was a top secret research and development program begun during World War II, in the wake of the Soviet Union's discovery of the American, British, and Canadian nuclear project. This scientific research was directed by Soviet nuclear physicist Igor Kurchatov, while the military logistics and intelligence efforts were undertaken and managed by NKVD director Lavrentiy Beria. The fathers of the Soviet nuclear program, Dr. Andrei Sakharov (left) with Dr. Igor Kurchatov (right). 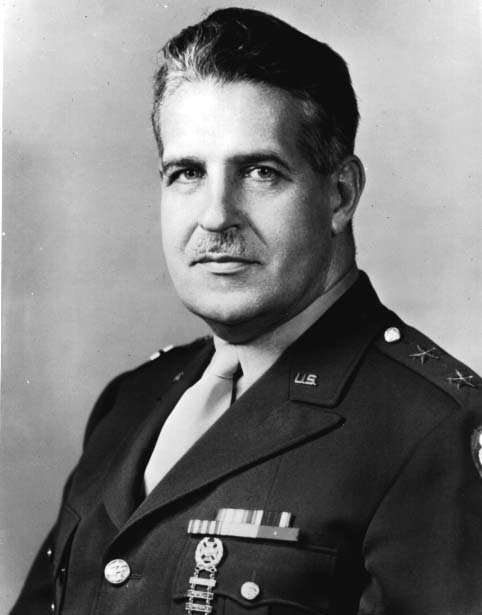 In September 1942, General Leslie R. Groves is charged with the construction of industrial-size plants for manufacturing plutonium and uranium. Groves recruited the DuPont Company to be the prime contractor for the construction of the plutonium production complex. The Hanford Engineer Works (HEW) broke ground in March 1943 and immediately launched a massive and technically challenging construction project. The B Reactor (105-B) at Hanford was the first large-scale plutonium production reactor in the world. It was designed and built by DuPont based on an experimental design by Enrico Fermi, and originally operated at 250 megawatts (thermal). The reactor was graphite moderated and water cooled. 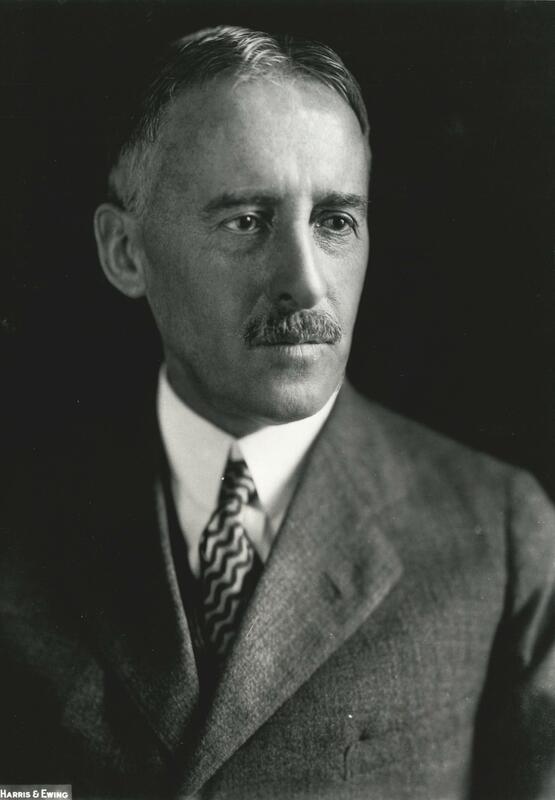 The Interim Committee was a secret high-level group created in May 1945 by United States Secretary of War Henry L. Stimson at the urging of leaders of the Manhattan Project and with the approval of President Harry S. Truman to advise on matters pertaining to nuclear energy. Composed of prominent political, scientific and industrial figures, the Interim Committee had broad terms of reference which included advising the President on wartime controls and the release of information, and making recommendations on post-war controls and policies related to nuclear energy, including legislation. Its first duty was to advise on the manner in which nuclear weapons should be employed against Japan. Later, it advised on legislation for the control and regulation of nuclear energy. Trinity was the code name of the first detonation of a nuclear weapon, conducted by the United States Army on July 16, 1945, as a result of the Manhattan Project. The new test site, named the White Sands Proving Ground, was built in the Jornada del Muerto desert about 35 miles (56 km) southeast of Socorro, New Mexico, at the Alamogordo Bombing and Gunnery Range (now part of the White Sands Missile Range). Trinity used an Trinity plutonium device, informally nicknamed "The Gadget" or "Christy['s] Gadget" after Robert Christy, the physicist behind the implosion method used in the device. Using the same conceptual design, the Fat Man device was detonated over Nagasaki, Japan, on August 9, 1945. The Trinity detonation produced the explosive power of about 20 kilotons of TNT (84 TJ). The atomic bombings of the cities of Hiroshima and Nagasaki in Japan were conducted by the United States during the final stages of World War II in August 1945. The two bombings were the first and remain the only use of nuclear weapons in wartime. By August 1945, the Allied Manhattan Project had successfully tested an atomic device and had produced weapons based on two alternate designs. A uranium gun-type atomic bomb (Little Boy) was dropped on Hiroshima on August 6, 1945, followed by a plutonium implosion-type bomb (Fat Man) on the city of Nagasaki on August 9. Within the first two to four months of the bombings, the acute effects killed 90,000–166,000 people in Hiroshima and 60,000–80,000 in Nagasaki; roughly half of the deaths in each city occurred on the first day. On August 15, just days after the bombing of Nagasaki and the Soviet Union's declaration of war, Japan announced its surrender to the Allies. On September 2, it signed the instrument of surrender, ending World War II. The bombings' role in Japan's surrender and their ethical justification are still debated. The United Nations Atomic Energy Commission (UNAEC) was founded on 24 January 1946 by Resolution 1 of the United Nations General Assembly "to deal with the problems raised by the discovery of atomic energy." 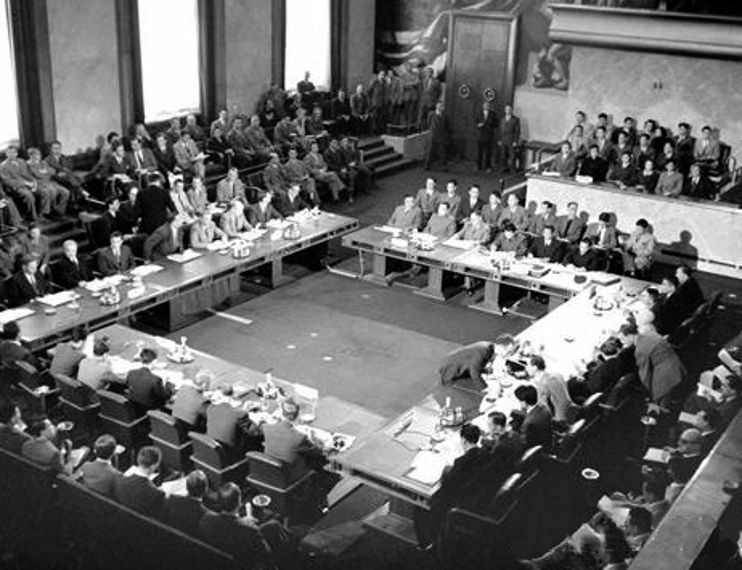 The General Assembly asked the Commission to "make specific proposals: (a) for extending between all nations the exchange of basic scientific information for peaceful ends; (b) for control of atomic energy to the extent necessary to ensure its use only for peaceful purposes; (c) for the elimination from national armaments of atomic weapons and of all other major weapons adaptable to mass destruction; (d) for effective safeguards by way of inspection and other means to protect complying States against the hazards of violations and evasions." 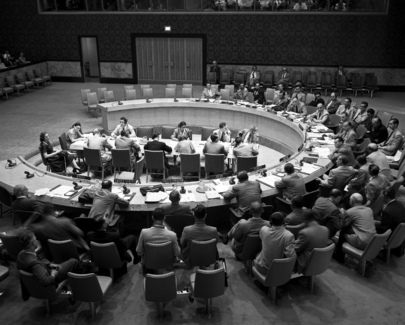 First session of the United Nations Security Council, held on January 17, 1946 at Church House, London. The Report on the International Control of Atomic Energy was written by a committee chaired by Dean Acheson and David Lilienthal in 1946 and is generally known as the Acheson–Lilienthal Report or Plan. The primary message of the report was that control of atomic energy through inspections and policing operations was unlikely to succeed. Instead, the report proposed that all fissile material be owned by an international agency to be called the Atomic Development Authority, which would release small amounts to individual nations for the development of peaceful uses of atomic energy. The RDS-1 (Russian: РДС-1), also known as Izdeliye 501 (article 501) and First Lightning (Первая молния, Pervaya molniya), was used in the Soviet Union's first nuclear weapon test. The United States assigned it the code-name Joe-1, in reference to Joseph Stalin. It was exploded on 29 August 1949 at 7 in the morning, at Semipalatinsk, Kazakh SSR, after a top-secret R&D project. The mushroom cloud from the "First lightning" test (1949). In 1950, calculations by the Polish mathematician Stanislaw Ulam and his collaborator Cornelius Everett, along with confirmations by Fermi, had shown that not only was Teller's earlier estimate of the quantity of tritium needed for the H-bomb a low one, but that even with higher amounts of tritium, the energy loss in the fusion process would be too great to enable the fusion reaction to propagate. However, in 1951, in the joint report by Ulam and Teller of March 1951, "Hydrodynamic Lenses and Radiation Mirrors", an innovative idea emerged, and it was developed into the first workable design for a megaton-range H-bomb. The exact contribution provided respectively from Ulam and Teller to what became known as the Teller–Ulam design is not definitively known in the public domain, and the exact contributions of each and how the final idea was arrived upon has been a point of dispute in both public and classified discussions since the early 1950s. Operation Hurricane was the test of the first British atomic device on 3 October 1952. 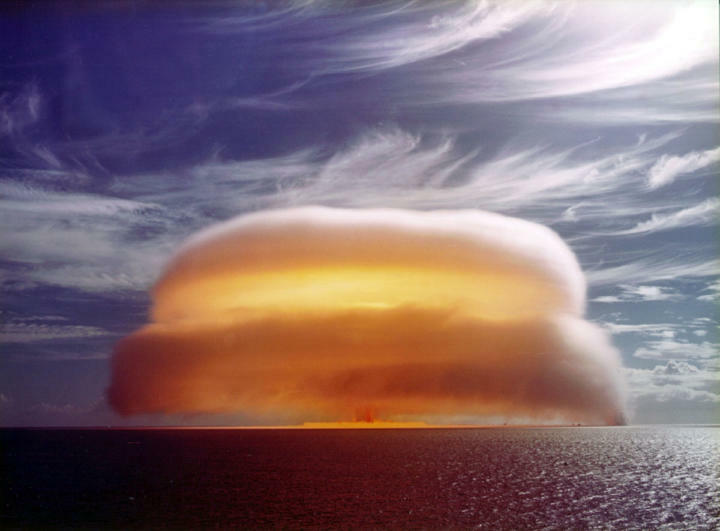 A plutonium implosion device was detonated in the lagoon between the Montebello Islands, Western Australia. Ivy Mike was the codename given to the first test of a full-scale thermonuclear device, in which part of the explosive yield comes from nuclear fusion. It was detonated on November 1, 1952 by the United States on Enewetak, an atoll in the Pacific Ocean, as part of Operation Ivy. The device was the first full test of the Teller-Ulam design, a staged fusion bomb, and was the first successful test of a hydrogen bomb. The mushroom cloud from the Mike shot. Ivy King was the largest pure fission nuclear bomb ever tested by the United States. The bomb was tested during the Truman administration as part of Operation Ivy. This series of tests involved the development of very powerful nuclear weapons in response to the nuclear weapons program of the Soviet Union. 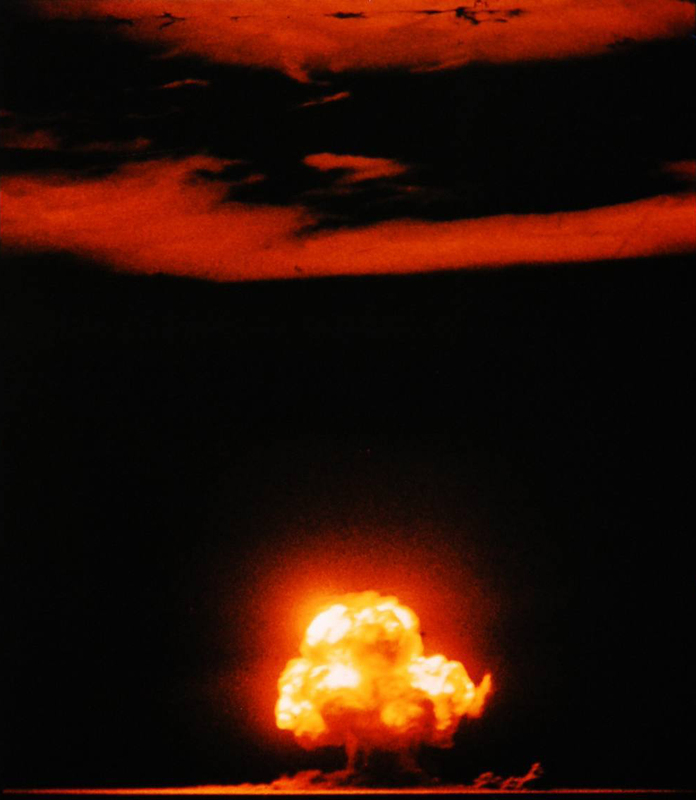 The production of Ivy King was hurried so it would be ready if its sister project, Ivy Mike, failed in its attempt to achieve a thermonuclear reaction. The Ivy King test actually took place two weeks after Mike. Unlike the Mike bomb, the Ivy King device could theoretically have been added to United States' nuclear arsenal because it was designed to be air-deliverable. Operation Cue, evaluates the effects of nuclear detonations on civilian communities. Anything From nebraskastudies.org and Wikipedia, the free encyclopedia. Eerie nuclear tests on houses and dummies at the Nevada Test Site. Less than one year after the United States tested its first hydrogen bomb, the Soviets detonate a 400-kiloton device in Kazakhstan. The explosive power was 30 times that of the U.S. atomic. 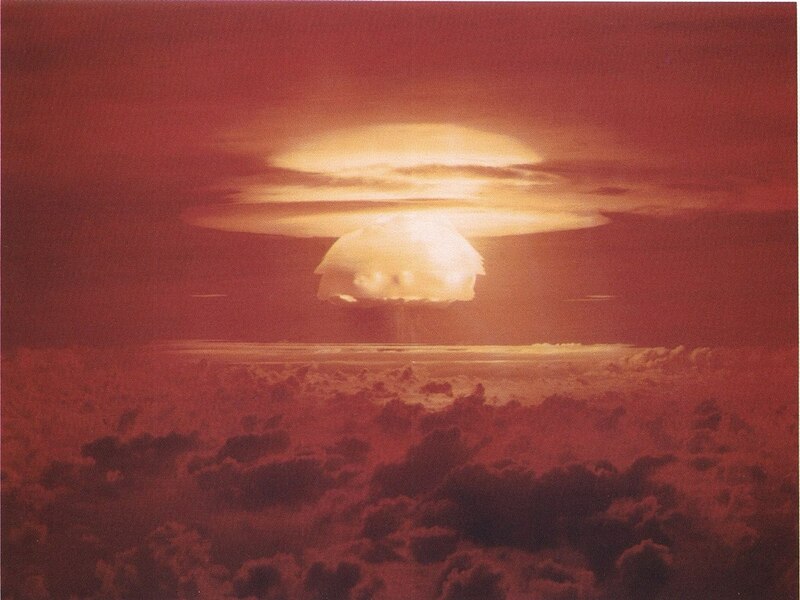 Castle Bravo was the code name given to the first United States test of a dry fuel, hydrogen bomb, detonated on March 1, 1954, at Bikini Atoll, Marshall Islands, as the first test of Operation Castle. Castle Bravo was the most powerful nuclear device ever detonated by the United States (and just under one-third the energy of the Tsar Bomba, the most powerful device ever detonated), with a yield of 15 megatons of TNT. That yield, far exceeding the expected yield of 4 to 8 megatons (6 Mt predicted), combined with other factors, led to the most significant accidental radioactive contamination ever caused by the United States. The United States also called for an international scientific conference on all of the peaceful aspects of nuclear power. By November 1954, it had become clear that the Soviet Union would reject any international custody of fissile material, but that a clearing house for nuclear transactions might be possible. From 8 to 20 August 1955, the United Nations held the International Conference on the Peaceful Uses of Atomic Energy in Geneva, Switzerland. During 1956, an IAEA Statute Conference was held to draft the founding documents for the IAEA, and the IAEA Statute was completed at a conference in 1957. 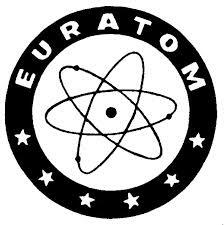 The European Atomic Energy Community (EAEC or Euratom) is an international organisation founded in 1958 with the purpose of creating a specialist market for nuclear power in Europe, developing nuclear energy and distributing it to its member states while selling the surplus to non-member states. It is legally distinct from the European Union (EU), but has the same membership, and is governed by the EU's institutions. It was established by the Euratom Treaty on 25 March 1957 alongside the European Economic Community/EEC, being taken over by the executive institutions of the EEC in 1967. The Shippingport Atomic Power Station was the world’s first full-scale atomic electric power plant devoted exclusively to peacetime uses. It was located near the present-day Beaver Valley Nuclear Generating Station on the Ohio River in Beaver County, Pennsylvania. The reactor reached criticality on December 2, 1957, and remained in operation until October 1982. The first electrical power was produced on December 18, 1957 as engineers synchronized the plant with the distribution grid of Duquesne Light Company. 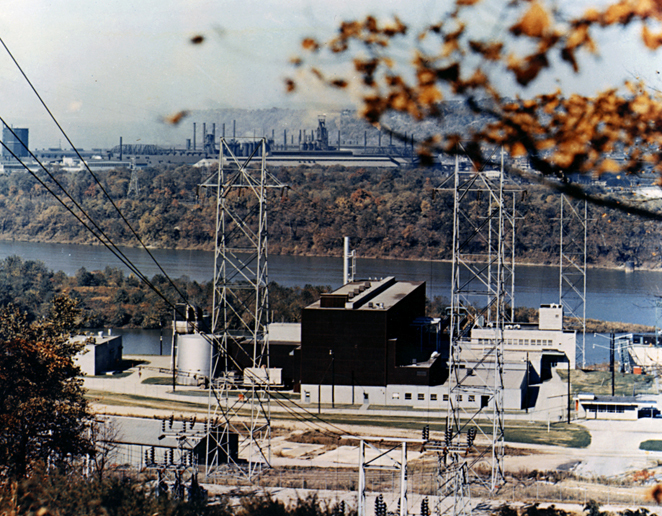 The Shippingport reactor was the first full-scale PWR nuclear power plant in the United States. The France's Reggane nuclear test series was a group of 4 nuclear tests conducted in 1960-1961. 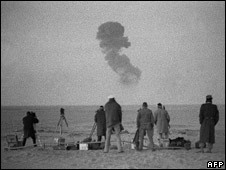 These tests preceded the In Ekker series, French nuclear tests series. 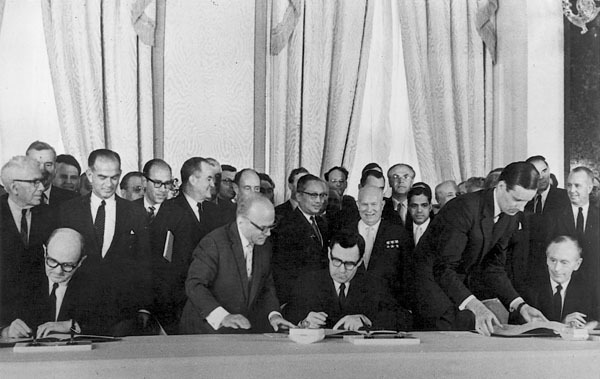 The main treaty was opened for signature on December 1, 1959, and officially entered into force on June 23, 1961. The treaty was the first arms control agreement established during the Cold War, and states in Article 5 "the treaty prohibits nuclear explosions or disposal of radioactive wastes." Conceived by Dwight D. Eisenhower and John F. Kennedy, the 1961 McCloy–Zorin Accords between the United States and the Soviet Union established a foundation or "roadmap" for all future negotiations and international treaties with regard to nuclear and general and complete disarmament under effective international control. Effectively aiming at abolishing war as an institution, it was unanimously passed by the UN General Assembly on 20 December. The Cuban missile crisis was a 13-day confrontation in October 1962 between the Soviet Union and Cuba on one side and the United States on the other side. The crisis is generally regarded as the moment in which the Cold War came closest to turning into a nuclear conflict and is also the first documented instance of mutual assured destruction (MAD) being discussed as a determining factor in a major international arms agreement. After the US had placed nuclear missiles in Turkey and Italy, aimed at Moscow, and the failed US attempt to overthrow the Cuban regime, in May 1962 Nikita Khrushchev proposed the idea of placing Soviet nuclear missiles in Cuba to deter any future invasion attempt. During a meeting between Khrushchev and Fidel Castro that July, a secret agreement was reached and construction of several missile sites began in the late summer. The Limited Test Ban Treaty (LTBT) is a treaty prohibiting all test detonations of nuclear weapons except underground. It was developed both to slow the arms race (nuclear testing was, at the time, necessary for continued developments in nuclear weapons), and to stop the excessive release of nuclear fallout into the planet's atmosphere. The Treaty was signed and ratified by the governments of the Soviet Union, the United Kingdom, and the United States during the autumn of 1963. 7 October 1963 President Kennedy signs the Limited Nuclear Test Ban Treaty in the Treaty Room at the White House. China established the Lop Nor Nuclear Test Base on 16 October 1959 with Soviet assistance in selection of the site, with its headquarters at Malan, about 125 km (78 mi) northwest of Qinggir. 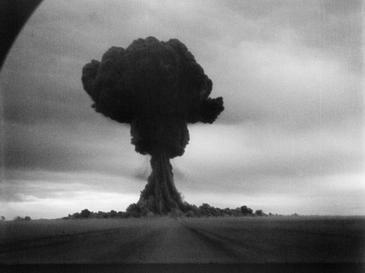 The first Chinese nuclear bomb test, codenamed "596", was tested at Lop Nur in 1964. 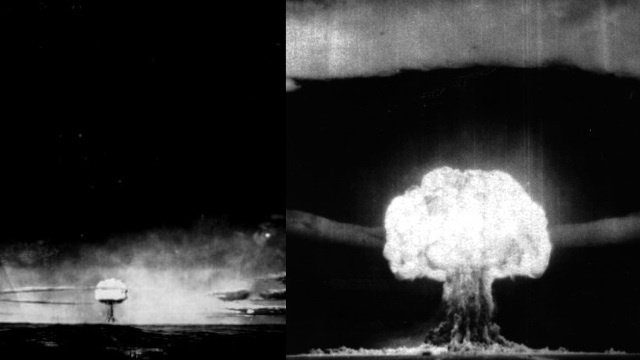 The PRC detonated its first hydrogen bomb on June 17, 1967. 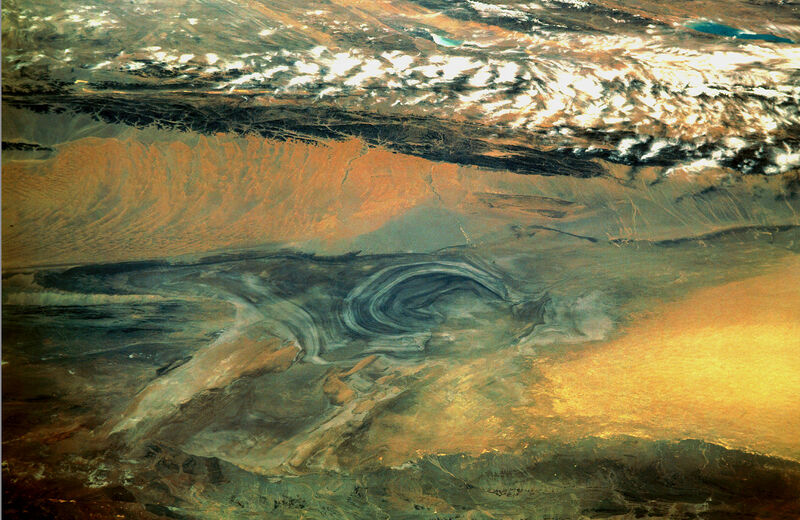 Satellite picture of the Basin of the former sea of Lop Nur. The Treaty of Tlatelolco is the conventional name given to the Treaty for the Prohibition of Nuclear Weapons in Latin America and the Caribbean. Under the treaty, the states parties agree to prohibit and prevent the "testing, use, manufacture, production or acquisition by any means whatsoever of any nuclear weapons" and the "receipt, storage, installation, deployment and any form of possession of any nuclear weapons." The Treaty on the Non-Proliferation of Nuclear Weapons, commonly known as the Non-Proliferation Treaty or NPT, is an international treaty whose objective is to prevent the spread of nuclear weapons and weapons technology, to promote cooperation in the peaceful uses of nuclear energy and to further the goal of achieving nuclear disarmament and general and complete disarmament. Opened for signature in 1968, the Treaty entered into force in 1970. On 11 May 1995, the Treaty was extended indefinitely. More countries have adhered to the NPT than any other arms limitation and disarmament agreement, a testament to the Treaty's significance. A total of 190 states have joined the Treaty, though North Korea, which acceded to the NPT in 1985 but never came into compliance, announced its withdrawal in 2003. Four UN member states have never joined the NPT: India, Israel, Pakistan and South Sudan. Canopus was the code name for France's first two-stage thermonuclear test, conducted on August 24, 1968 at Fangataufa atoll. The test made France the fifth country to test a thermonuclear device after the United States, the Soviet Union, the United Kingdom and China. In 1966, France was able to use fusion fuel to boost plutonium implosion devices with the Rigel shot. Roger Dautry, a nuclear physicist, was selected by the CEA to lead the development effort to construct a two-stage weapon. France did not have the ability to produce the materials needed for a two-stage thermonuclear device at the time, so 151 tons of heavy water was purchased from Norway and an additional 168 tons from the United States. This heavy water went into nuclear reactors in 1967 to produce tritium needed for the device. The Strategic Arms Limitation Talks (SALT) were two rounds of bilateral talks and corresponding international treaties involving the United States and the Soviet Union—the Cold War superpowers—on the issue of armament control. The two rounds of talks and agreements were SALT I and SALT II. Negotiations commenced in Helsinki, Finland, in November 1969. SALT I led to the Anti-Ballistic Missile Treaty and an interim agreement between the two countries. Although SALT II resulted in an agreement in 1979, the United States chose not to ratify the treaty in response to the Soviet invasion of Afghanistan, which took place later that year. The United States eventually withdrew from SALT II in 1986. 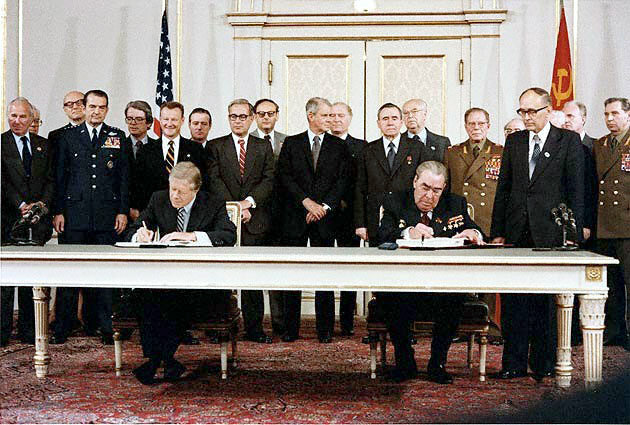 The treaties led to START (Strategic Arms Reduction Treaty), which consisted of START I (a 1991 completed agreement between the United States and the Soviet Union) and START II (a 1993 agreement between the United States and Russia, which was never ratified by the United States), both of which proposed specific capacities on each side's number of nuclear weapons. A successor to START I, New START, entered proposal and was eventually ratified on February of 2011. The Seabed Arms Control Treaty is a multilateral agreement between the United States, Soviet Union (now Russia), United Kingdom, and 91 other countries banning the emplacement of nuclear weapons or "weapons of mass destruction" on the ocean floor beyond a 12-mile (22.2 km) coastal zone. It allows signatories to observe all seabed "activities" of any other signatory beyond the 12-mile zone to ensure compliance. 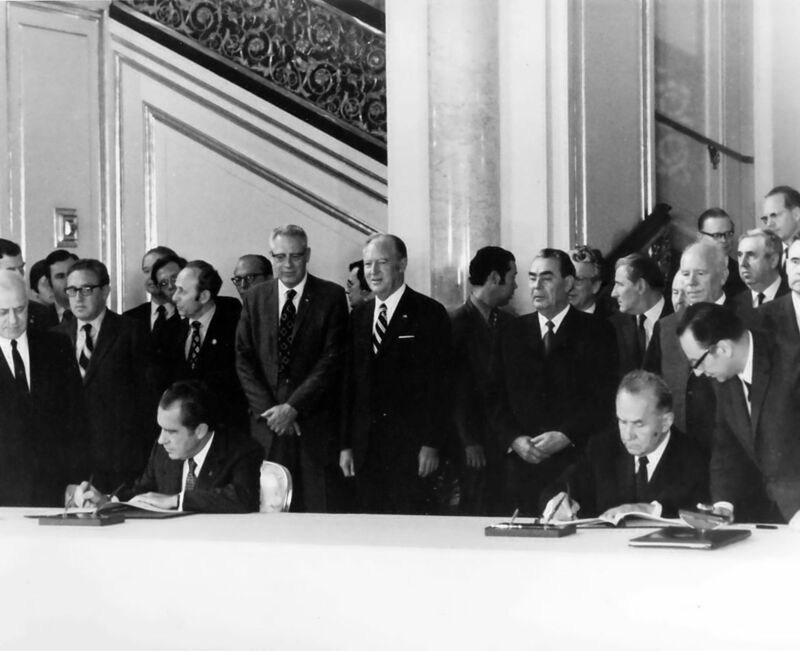 The Seabed Arms Control Treaty was opened for signature in Washington, London, and Moscow on 11 February 1971. It entered into force 18 May 1972, when the United States, the United Kingdom, the Soviet Union, and more than 22 nations had deposited instruments of ratification. TheAnti-Ballistic Missile Treaty (ABM Treaty or ABMT) was a treaty between the United States and the Soviet Union on the limitation of the anti-ballistic missile (ABM) systems used in defending areas against missile-delivered nuclear weapons. Under the terms of the treaty, each party was limited to two ABM complexes, each of which were to be limited to 100 anti-ballistic missiles. Signed in 1972, it was in force for the next 30 years. Following the dissolution of the Soviet Union, in 1997 the United States and four former Soviet republics agreed to succeed to the treaty. In June 2002 the United States withdrew from the treaty, leading to its termination. Smiling Buddha (MEA designation: Pokhran-I) is an assigned codename of India's first nuclear weapon explosion, which took place on 18 May 1974. The device was detonated by the Indian Army on the army base, Pokhran Test Range, Rajasthan, under the supervision of several key Indian army personnel. The Pokhran-I was also the first confirmed nuclear test by a nation outside the five permanent members of the United Nations Security Council. Officially, the Indian Ministry of External Affairs (MEA) claimed this test was a "peaceful nuclear explosion", but it was actually part of an accelerated nuclear weapons program.The explosive yield remains uncertain, with the most common estimates around 8kt. Nuclear Suppliers Group (NSG) is a multinational body concerned with reducing nuclear proliferation by controlling the export and re-transfer of materials that may be applicable to nuclear weapon development and by improving safeguards and protection on existing materials. The Treaty on the Limitation of Underground Nuclear Weapon Tests, also known as the Threshold Test Ban Treaty (or TTBT), was signed in July 1974 by the USA and the USSR. It establishes a nuclear "threshold," by prohibiting nuclear tests of devices having a yield exceeding 150 kilotons (equivalent to 150,000 tons of TNT). Foreign ministers sign the Limited Test Ban Treaty. 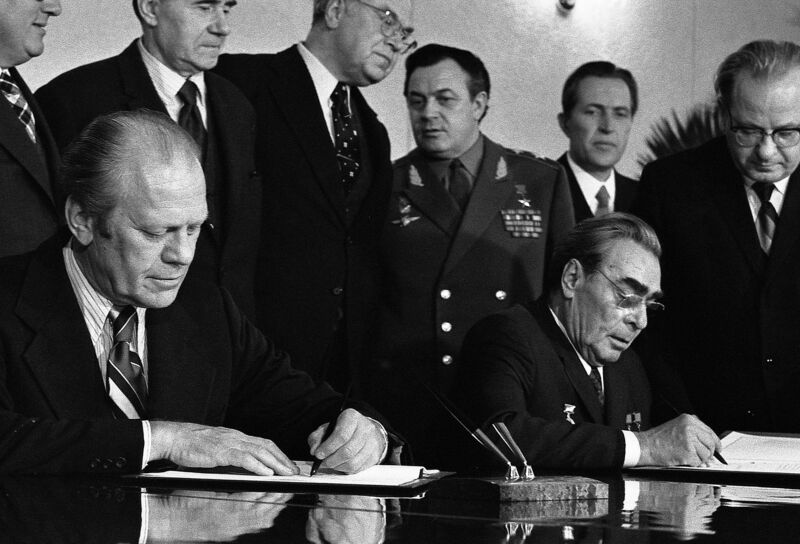 American President Gerald Ford and Soviet General Secretary Leonid Brezhnev sign a Joint Communiqué following talks on the limitation of strategic offensive arms in Vladivostok on November 24, 1974. The Treaty on Underground Nuclear Explosions for Peaceful Purposes was signed in April 1976. The agreement consists of a Treaty, a detailed protocol to the Treaty, and an agreed statement delineating certain important activities which do not constitute a peaceful application as that term is used in the Treaty. The PNE Treaty governs all nuclear explosions carried out at locations outside the weapons test sites specified under the Threshold Test Ban Treaty. In the PNE Treaty the United States and the Soviet Union agreed: not to carry out any individual nuclear explosions having a yield exceeding 150 kilotons; not to carry out any group explosion (consisting of a number of individual explosions) having an aggregate yield exceeding 1,500 kilotons; and not to carry out any group explosion having an aggregate yield exceeding 150 kilotons unless the individual explosions in the group could be identified and measured by agreed verification procedures. The parties also reaffirmed their obligations to comply fully with the Limited Test Ban Treaty of 1963. Download the Announcement of the PNE Treaty. Map of the Former Soviet Union showing the location of the122 PNE sites. 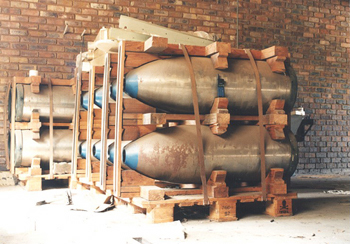 The South African Atomic Energy Board (AEB) selected a test site in the Kalahari Desert at the Vastrap weapons range north of Upington. Two test shafts were completed in 1976 and 1977. One shaft was 385 metres deep, the other, 216 metres. In 1977. In mid-1977, the AEB produced a gun-type device—without a highly enriched uranium (HEU) core. Although the Y-Plant was operating, it had not yet produced enough weapons-grade uranium for a device. As has happened in programmes in other nations, the development of the devices had outpaced the production of the fissile material. How that test was cancelled has been well publicised. 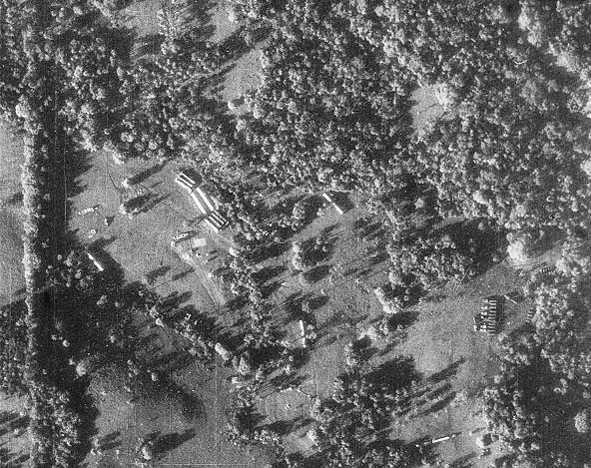 Soviet intelligence detected test preparations and in early August alerted the United States; U.S. intelligence confirmed the existence of the test site with an overflight of a Lockheed SR-71 spy plane. On 28 August, the Washington Post quoted a U.S. official: "I'd say we were 99 percent certain that the construction was preparation for an atomic test." The Three Mile Island accident was a partial nuclear meltdown that occurred on March 28, 1979 in one of the two Three Mile Island nuclear reactors in Dauphin County, Pennsylvania, United States. It was the worst accident in U.S. commercial nuclear power plant history. The incident was rated a five on the seven-point International Nuclear Event Scale: Accident With Wider Consequences. President Jimmy Carter touring the TMI-2 control room on April 1, 1979. SALT II was a series of talks between United States and Soviet negotiators from 1972 to 1979 which sought to curtail the manufacture of strategic nuclear weapons. It was a continuation of the SALT I talks and was led by representatives from both countries. SALT II was the first nuclear arms treaty which assumed real reductions in strategic forces to 2,250 of all categories of delivery vehicles on both sides. An agreement to limit strategic launchers was reached in Vienna on June 18, 1979, and was signed by Leonid Brezhnev and Jimmy Carter. 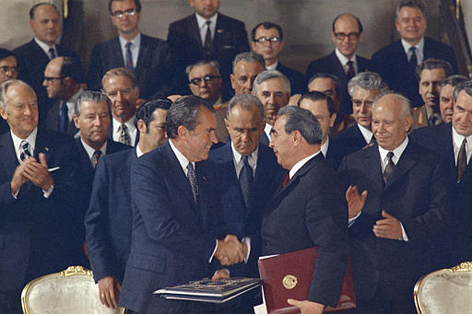 Jimmy Carter and Leonid Brezhnev signing SALT II treaty, June 18, 1979, in Vienna. The Convention on the Physical Protection of Nuclear Material was signed at Vienna and at New York on 3 March 1980. The Convention is the only international legally binding undertaking in the area of physical protection of nuclear material. It establishes measures related to the prevention, detection and punishment of offenses relating to nuclear material. The Strategic Defense Initiative (SDI) was proposed by U.S. President Ronald Reagan on March 23, 1983, to use ground-based and space-based systems to protect the United States from attack by strategic nuclear ballistic missiles. The initiative focused on strategic defense rather than the prior strategic offense doctrine of Mutual Assured Destruction (MAD). The Strategic Defense Initiative Organization (SDIO) was set up in 1984 within the United States Department of Defense to oversee the Strategic Defense Initiative. The ambitious initiative was widely criticized as being unrealistic, even unscientific, as well as for threatening to destabilize MAD and re-ignite "an offensive arms race". SDI was derided, largely in the mainstream media, as "Star Wars", after the popular 1977 film by George Lucas. In 1987, the American Physical Society concluded that a global shield such as "Star Wars" was not only impossible with existing technology, but that ten more years of research was needed to learn whether it might ever be feasible. The Treaty of Rarotonga is the common name for the South Pacific Nuclear Free Zone Treaty, which formalises a Nuclear-Weapon-Free Zone in the South Pacific. The treaty bans the use, testing, and possession of nuclear weapons within the borders of the zone. It was signed by the South Pacific nations of Australia, the Cook Islands, Fiji, Kiribati, Nauru, New Zealand, Niue, Papua New Guinea, the Solomon Islands, Tonga, Tuvalu, Vanuatu and Western Samoa on the island of Rarotonga (where the capital of the Cook Islands is located) on 6 August 1985, came into force with the 8th ratification, and has since been ratified by all of those states. The Chernobyl disaster was a catastrophic nuclear accident that occurred on 26 April 1986 at the Chernobyl Nuclear Power Plant in Ukraine (then officially the Ukrainian SSR), which was under the direct jurisdiction of the central authorities of the Soviet Union. An explosion and fire released large quantities of radioactive particles into the atmosphere, which spread over much of the western USSR and Europe. The Chernobyl disaster was the worst nuclear power plant accident in history in terms of cost and casualties, and is one of only two classified as a level 7 event (the maximum classification) on the International Nuclear Event Scale (the other being the Fukushima Daiichi nuclear disaster in 2011). The battle to contain the contamination and avert a greater catastrophe ultimately involved over 500,000 workers and cost an estimated 18 billion rubles (18 billion $USD). During the accident itself, 31 people died, and long-term effects such as cancers and deformities are still being accounted for. The Convention on Assistance in the Case of a Nuclear Accident or Radiological Emergency is a 1986 treaty of the International Atomic Energy Agency (IAEA) whereby states have agreed to provide notification to the IAEA of any assistance that they can provide in the case of a nuclear accident that occurs in another state that has ratified the treaty. Along with the Convention on Early Notification of a Nuclear Accident, it was adopted in direct response to the April 1986 Chernobyl disaster. The Intermediate-Range Nuclear Forces Treaty (INF) is a 1987 agreement between the United States and the Soviet Union. Signed in Washington, D.C. by U.S. President Ronald Reagan and General Secretary Mikhail Gorbachev on 8 December 1987, it was ratified by the United States Senate on 27 May 1988 and came into force on 1 June of that year. The treaty is formally titled The Treaty Between the United States of America and the Union of Soviet Socialist Republics on the Elimination of Their Intermediate-Range and Shorter-Range Missiles. The treaty eliminated nuclear and conventional ground-launched ballistic and cruise missiles with intermediate ranges, defined as between 500-5,500 km (300-3,400 miles). U.S. President Ronald Reagan and Soviet General Secretary Mikhail Gorbachev signing the INF Treaty in the East Room at the White House in 1987. START (Strategic Arms Reduction Treaty) was a bilateral treaty between the United States of America and the Union of Soviet Socialist Republics (USSR) on the Reduction and Limitation of Strategic Offensive Arms. The treaty was signed on 31 July 1991 and entered into force on 5 December 1994. The treaty barred its signatories from deploying more than 6,000 nuclear warheads atop a total of 1,600 ICBMs, inter-continental ballistic missiles, and bombers. START negotiated the largest and most complex arms control treaty in history, and its final implementation in late 2001 resulted in the removal of about 80 percent of all strategic nuclear weapons then in existence. Proposed by United States President Ronald Reagan, it was renamed START I after negotiations began on the second START treaty. START II (Strategic Arms Reduction Treaty) was a bilateral treaty between the United States of America and Russia on the Reduction and Limitation of Strategic Offensive Arms. It was signed by United States President George H. W. Bush and Russian President Boris Yeltsin on 3 January 1993, banning the use of multiple independently targetable reentry vehicles (MIRVs) on intercontinental ballistic missiles (ICBMs). Hence, it is often cited as the De-MIRV-ing Agreement. It never entered into effect. It was ratified by the U.S. Senate on 26 January 1996 with a vote of 87-4. Russia ratified START II on 14 April 2000, but on 14 June 2002, withdrew from the treaty in response to U.S. withdrawal from the ABM Treaty. The nuclear tests at Mururoa were meant to provide the nation with enough data to improve further nuclear technology without needing additional series of tests. The test site at Mururoa was dismantled following France’s last nuclear test to date, detonated on 27 January 1996, but the atoll is still guarded by the French Forces. In total, 181 explosions took place at Moruroa and Fangataufa, 41 of which were atmospheric. However, the total number has been variously reported, nuclear scientists working at the site claim 175 explosions in total took place in Pacific. The Comprehensive Nuclear-Test-Ban Treaty (CTBT) is a multilateral treaty by which states agree to ban all nuclear explosions in all environments, for military or civilian purposes. It was adopted by the United Nations General Assembly on 10 September 1996 but it has not entered into force due to the non-ratification of eight specific states. Pokhran-II was the series of five nuclear bomb test explosions conducted by India at the Indian Army's Pokhran Test Range in May 1998. It was the second nuclear test. Pokhran-II consisted of five detonations, of which the first was a fusion bomb and the remaining four were fission bombs. These nuclear tests resulted in a variety of sanctions against India by a number of major states, including Japan and the United States. A cylindrical shaped nuclear bomb, Shakti I, prior to its detonation. Chagai-I is the codename given to the five underground nuclear tests conducted by Pakistan at 1515 hrs PST on 28 May 1998. The tests were performed at the Ras Koh Hills in the Chagai District of the Balochistan Province of Pakistan. The Chagai-I— the first public nuclear tests operation of Pakistan— is considered a milestone in the history of Pakistan that was conducted in a direct response to India's second nuclear tests, Operation Shakti, on 11 and 13 May 1998. Nuclear weapon testings by Pakistan and India resulted in a variety of economic sanctions on both states by a number of major powers, particularly the United States and Japan. With the performance of the simultaneous atomic testing of the five nuclear devices, Pakistan, thus became the seventh nuclear power in the world to successfully develop and publicly test nuclear weapons, despite international outcry. The Treaty Between the United States of America and the Russian Federation on Strategic Offensive Reductions (SORT), also known as the Treaty of Moscow, was a strategic arms reduction treaty between the United States and Russia that was in force from June 2003 until February 2011 when it was superseded by the New START treaty. At the time, SORT was positioned as "represent[ing] an important element of the new strategic relationship" between the two countries with both parties agreeing to limit their nuclear arsenal to between 1700 and 2200 operationally deployed warheads each. It was signed in Moscow on 24 May 2002. After ratification by the U.S. Senate and the State Duma, SORT came into force on 1 June 2003. It would have expired on 31 December 2012 if not superseded by New START. Either party could have withdrawn from the treaty upon giving three months written notice to the other. In 2003, the International Atomic Energy Agency (IAEA) first reported that Iran had not declared sensitive enrichment and reprocessing activities. Enrichment can be used to produce uranium for reactor fuel or (at higher enrichment levels) for weapons. Iran says its nuclear program is peaceful, and has enriched uranium to less than 5%, consistent with fuel for a civilian nuclear power plant. Iran also claims that it was forced to resort to secrecy after US pressure caused several of its nuclear contracts with foreign governments to fall through. After the IAEA Board of Governors reported Iran's noncompliance with its safeguards agreement to the UN Security Council, the Council demanded that Iran suspend its nuclear enrichment activities. The 2006 North Korean nuclear test was the detonation of a nuclear device conducted by North Korea on October 9, 2006. North Korea announced its intention to conduct a test on October 3, six days prior, and in doing so became the first nation to give warning of its first nuclear test. The blast is estimated to have had an explosive force of less than one kiloton, and some radioactive output was detected. United States officials suggested the device may have been a nuclear explosive that misfired. The 2009 North Korean nuclear test was the underground detonation of a nuclear device conducted on Monday, May 25, 2009 by the Democratic People's Republic of Korea. This was its second nuclear test, the first test, a fizzle, having taken place in October 2006. Following the nuclear test, Pyongyang also conducted several missile tests. A scientific paper later estimated the yield as 2.35 kilotons. Presidents Obama and Medvedev after signing the Prague Treaty. 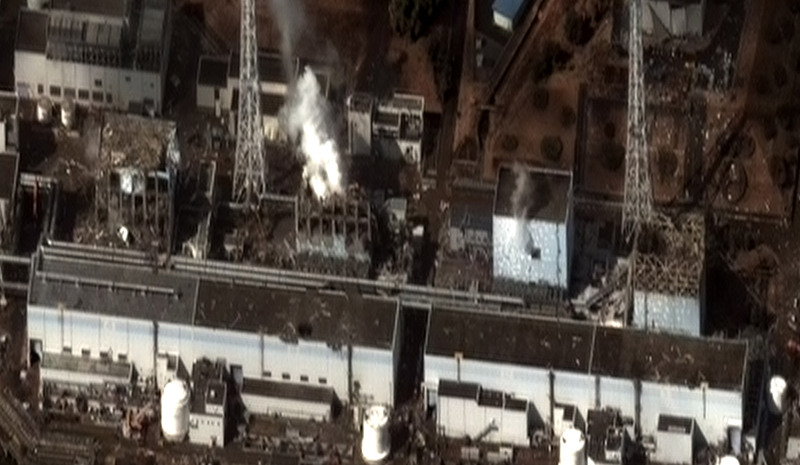 The Fukushima Daiichi nuclear disaster was an energy accident at the Fukushima I Nuclear Power Plant in Fukushima, initiated primarily by the tsunami following the Tōhoku earthquake on 11 March 2011. Immediately after the earthquake, the active reactors automatically shut down their sustained fission reactions. However, the tsunami destroyed the emergency generators cooling the reactors, causing reactor 4 to overheat from the decay heat from the fuel rods. The insufficient cooling led to three nuclear meltdowns and the release of radioactive material beginning on 12 March. Several hydrogen-air chemical explosions occurred between 12 March and 15 March. Image on 16 March 2011 of the four damaged reactor buildings. From left to right: Unit 4, 3, 2 and 1. Iran's first nuclear power plant, Bushehr I reactor was complete with major assistance of Russian government agency Rosatom and officially opened on 12 September 2011. Iran has announced that it is working on a new 360 MW nuclear power plant to be located in Darkhovin. The Russian engineering contractor Atomenergoprom said the Bushehr Nuclear Power Plant would reach full capacity by the end of 2012. Iran has also indicated that it will seek more medium-sized nuclear power plants and uranium mines in the future. On 12 February 2013, North Korean state media announced it had conducted an underground nuclear test, its third in seven years. A tremor that exhibited a nuclear bomb signature with an initial magnitude 4.9 (later revised to 5.1) was detected by the China Earthquake Networks Center, Comprehensive Nuclear-Test-Ban Treaty Organization Preparatory Commission and the United States Geological Survey. In response, Japan summoned an emergency United Nations meeting for 12 February and South Korea raised its military alert status. It is not known if the explosion was nuclear, or a conventional explosion designed to mimic a nuclear blast; as of two days after the blast, Chinese, Japanese, and South Korean investigators had failed to detect any radiation. The Iran nuclear deal framework was a preliminary framework agreement reached in 2015 between the Islamic Republic of Iran and a group of world powers: the P5+1 (the permanent members of the United Nations Security Council–the United States, the United Kingdom, Russia, France, and China plus Germany), plus the European Union. Negotiations for a framework deal over the nuclear program of Iran took place between the foreign ministers of the countries at a series of meetings held from 26 March to 2 April 2015 in Lausanne, Switzerland. On 2 April the talks came to a conclusion and a press conference was held by Federica Mogherini (High Representative of the European Union for Foreign Affairs) and Mohammad Javad Zarif (Minister of Foreign Affairs of Iran) to announce that the eight nations had reached an agreement on a framework deal. The parties announced that "Today, we have taken a decisive step: we have reached solutions on key parameters of a Joint Comprehensive Plan of Action." with a goal of working out this final deal by 30 June 2015. Announcing the framework, Foreign Minister Zarif stated: "No agreement has been reached so we do not have any obligation yet. Nobody has obligations now other than obligations that we already undertook under the Joint Plan of Action that we adopted in Geneva in November 2013."